That Solyndra's executives failed to notify their investors and the DOE in a honest fashion is the issue here. Is it corporate malfeasance and negligence? Without a doubt. Is it a crime? We'll soon find out. 9. Competitors How were other CIGS firms funded and how are they faring? Solyndra was a manufacturer of cylindrical panels of CIGS thin-film solar cells based in Fremont, California. The company suspended all of its operations as of August 2011 leaving behind the United States government as its largest creditor. In May 2010, the company was personally promoted by President Obama in his visit as a model for government investment in green technology, and was also visited by former California governor, Arnold Schwarzenegger. A $535 million loan guarantee was applied for under the Bush administration but the loan was denied. The $535 million loan guarantee was later granted by the Obama administration. Private investors also invested more than $1 billion into the company. The company's investors and executives had made substantial donations to Obama's campaign, and the company had also spent a large sum of money on lobbying. Due to price pressure in the period of constructing the new plant, the Fab 2, the company had shut down its original plant, Fab 1, and simultaneously reduced its staff to approximately 1,100 employees. In early Sep 2011, the company ceased all business activity, filed for Chapter 11 bankruptcy, and laid off all employees. The company is also being sued by employees who were abruptly laid off. 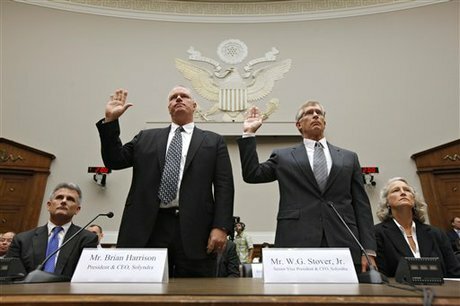 On Sep 8, 2011, Federal Bureau of Investigation Agents executed multiple search warrants at the company's headquarters in Fremont as part of an investigation by the Department of Energy's Office of the Inspector General. Jon Stewart's funny retelling of how the Obama administration approved a $535 million loan guarantee to the solar panel producer connected to an Obama fundraiser despite a flawed business model and bureaucrats sounding alarms. It's the eight-minute version of how the administration created an avoidable political disaster for itself at an inopportune time. 1703 - Section 1703 of Title XVII of the Energy Policy Act of 2005 authorizes the U.S. Department of Energy to support innovative clean energy technologies that are typically unable to obtain conventional private financing due to high technology risks. In addition, the technologies must avoid, reduce, or sequester air pollutants or anthropogenic emissions of greenhouse gases. Technologies we will consider include: biomass, hydrogen, solar, wind/hydropower, nuclear, advanced fossil energy coal, carbon sequestration practices/technologies, electricity delivery and energy reliability, alternative fuel vehicles, industrial energy efficiency projects, and pollution control equipment. Technologies with more than three implementations that have been active for more than five years are excluded. 1705 - The American Recovery and Reinvestment Act of 2009 amended the Loan Guarantee Program’s authorizing legislation by adding Section 1705 to EPAct. Section 1705 is a temporary program designed to address the current economic conditions of the nation. It authorizes loan guarantees for certain renewable energy systems, electric power transmission systems and leading edge biofuels projects that commence construction no later than September 30, 2011. ATVM - Advanced Technology Vehicles Manufacturing (ATVM) Loan Program - Section 136 of the Energy Independence and Security Act of 2007 established an incentive program – the ATVM – consisting of direct loans to support the development of advanced technology vehicles and associated components in the United States. The ATVM Loan Program supports the President’s goal to create green jobs in the automotive and component manufacturing industries and will help ensure that new advanced technology vehicles (ATV) meet a higher standard (125 percent of the 2005 base year CAFE fuel efficiency standards) than similarly classed conventional technology vehicles. This is the program the Republicans want to cut to offset Disaster Relief spending in the latest budget show down. CIGS - Copper Indium Gallium (di)Selenide - Used as light absorber material for Solyndra's thin-film solar cells. A I-III-VI2 semiconductor material composed of copper, indium, gallium, and selenium. The material is a solid solution of copper indium selenide (often abbreviated "CIS") and copper gallium selenide. It has a chemical formula of CuInxGa(1-x)Se2 where the value of x can vary from 1 (pure copper indium selenide) to 0 (pure copper gallium selenide). CIGS is a tetrahedrallybonded semiconductor, with the chalcopyrite crystal structure, and a bandgap varying continuously with x from about 1.0 eV (for copper indium selenide) to about 1.7 eV (for copper gallium selenide). CIGS Solar Cells - Because the CIGS strongly absorbs sunlight, a much thinner film is required than of other semiconductor materials. The CIGS absorber is deposited on a glass backing, along with electrodes to collect current. CIGS has an exceptionally high absorption coefficient of more than 105/cm for 1.5 eV and higher energy photons. CIGS solar cells with efficiencies greater than 20% have been claimed by both the National Renewable Energy Laboratory (NREL) and the Zentrum für Sonnenenergie und Wasserstoff Forschung (ZSW), which is the record to date for any thin film solar cell. Glass is commonly used as a substrate, however, many companies are also looking at lighter and more flexible substrates such as polyimide or metal foils A molybdenum layer is deposited (commonly by sputtering) which serves as the back contact and to reflect most unabsorbed light back into the absorber. Following Mo deposition a p-type CIGS absorber layer is grown by one of several unique methods. A thin n-type buffer layer is added on top of the absorber. The buffer is typically CdS deposited via chemical bath deposition. The buffer is overlaid with a thin, intrinsic ZnO layer which is capped by a thicker, Al doped ZnO layer. Despite increasing the series resistance, the intrinsic ZnO layer is beneficial to cell performance. The precise mechanism for the improvement is still being debated. The most common vacuum-based process co-evaporates or co-sputters copper, gallium, and indium, then anneals the resulting film with a selenide vapor to form the final CIGS structure. An alternative is to directly co-evaporate copper, gallium, indium and selenium onto a heated substrate. A non-vacuum-based alternative process deposits nanoparticles of the precursor materials on the substrate and then sinters them in situ. Electroplating is another low cost alternative to apply the CIGS layer. Fab 1 - After expanding production in 2008, Solyndra announced in Nov 2010 that it was mothballing its older plant, Fab 1, and postponing expansion of recently opened Fab 2, giving it an annual production capacity of about 300 megawatts. Market conditions were cited, with conventional solar modules manufactured in China by low-cost producers such as Suntech and Yingli offering stiff competition. In March 2010, Fab 1 had an annual capacity of 54 megawatts. Fab 2 - This ;new $733 million state-of-the-art robotic facility in Fremont, California opened in September 2010. Fab 2 was built with the support of a $535 million federal loan guarantee along with at least $198 million from private investors. Government Loan Guarantee - A government promise to assume a private debt obligation if the borrower defaults. Most loan guarantee programs are established to correct perceived market failures by which small borrowers, regardless of creditworthiness, lack access to the credit resources available to large borrowers. Loan guarantees can also be extended to large borrowers for political reasons. For example, Chrysler Corporation, one of the "big three" US automobile manufacturers, obtained a loan guarantee in 1979 amid its near-collapse, and lobbying by labor interests. The USDOE, on March 20, 2009, offered a $535 million loan guarantee to Solyndra, Inc. to support the construction of a commercial-scale manufacturing plant for its proprietary solar photovoltaic panels. After securing the loan guarantee, the Federal Financing Bank, a part of the Department of the Treasury, loaned Solyndra the money. LCOE - Levelized Cost Of Energy - the price at which electricity must be generated from a specific source to break even. It is an economic assessment of the cost of the energy-generating system including all the costs over its lifetime: initial investment, operations and maintenance, cost of fuel, cost of capital, and is very useful in calculating the costs of generation from different sources. Typically LCOE is calculated over 20 to 40 year lifetimes, and are given in the units of currency per kilowatt-hour. From Risk Section Solyndra's S1 SEC filing March 2010. Note that the factors other than sales price that might lead to a lower LCOE were not quantified. Based on the average sales prices of solar panels sold in the fourth fiscal quarter of 2009, our average sales price was $3.24 per watt, which was $1.29 per watt, or approximately 66%, higher than the $1.95 average sales price per watt of leading crystalline silicon photovoltaic manufacturers during the same period. As a result, certain system owners who focus more on the up-front price of solar panels than on achieving the lowest levelized cost of electricity per kilowatt hour, or LCOE, may choose the product offerings of those competitors that have a lower initial panel purchase price. The LCOE of a photovoltaic system is the ratio of a system’s total life cycle cost, which is the sum of the installed cost plus the present value of the total lifetime costs of the system, to its total lifetime energy output. If we fail to effectively demonstrate to system owners the LCOE value proposition of our systems, we may fail to achieve broader market acceptance of our systems, which would have an adverse impact on our ability to increase our revenue, gain market share and achieve and sustain profitability. OIG - Office of the Inspector General - An office that is part of Cabinet departments and independent agencies of the United States federal government. Each office includes an Inspector General and employees charged with identifying, auditing, and investigating fraud, waste, abuse, and mismanagement within the parent agency. In addition to representing Departments within the United States Government, some OIG's exist to investigate specific offenses. There are 73 Federal OIG's including the DOE OIG that is investigating Solyndra. Solyndra's Cylindrical Solar Systems for commercial rooftops - Solyndra designed, manufactured and sold solar photovoltaic (PV) systems composed of panels and mounting hardware for large, low-slope commercial rooftops. The panels perform optimally when mounted horizontally and packed closely together, thereby, the company claimed, covering significantly more of the typically available roof area and producing more electricity per rooftop on an annual basis than a conventional panel installation. The solar panels developed by the company were claimed to be unlike any other product ever tried in the industry. The panels were made of racks of cylindrical tubes (also called tubular solar panels), as opposed to traditional flat panels. Solyndra rolled its CIGS thin films into a cylindrical shape and places 40 of them in each 1-meter-by-2-meter panel. The cylindrical solar panels (think of fluorescent tube lights—except in reverse) can absorb energy from every direction (direct, indirect and reflected light). Each Solyndra cylinder, one inch in diameter, is made up of two tubes. The company used equipment it had developed to deposit CIGS on the outside of the inner tube, which includes up to 200 CIGS cells. On top of the CIGS material, it adds an "optical coupling agent", which concentrates the sunlight that shines through the outer tube. After inserting the inner tube into the outer tube, each cylinder is sealed with glass and metal to keep out moisture, which erodes CIGS's performance. The hermetic sealing technology is commonly used in fluorescent bulbs. TFSC - Thin-film Solar Cell - also called a thin-film photovoltaic cell (TFPV), is a solar cell that is made by depositing one or more thin layers (thin film) of photovoltaic material on a substrate. The thickness range of such a layer is wide and varies from a few nanometers to tens of micrometers. May 2005: Just as a global silicon shortage begins driving up prices of solar photovoltaics, Solyndra is founded to provide a cost-competitive alternative to silicon-based panels. July 2005: The Energy Policy Act of 2005 into law, creating the 1703 loan guarantee program. February 2006 - October 2006: In February, Solyndra raises its first round of venture financing, worth $10.6 million from CMEA Capital, Redpoint Ventures, and U.S. Venture Partners. In October, Argonaut Venture Capital, an investment arm of George Kaiser, invests $17 million into Solyndra. Madrone Capital Partners, an investment arm of the Walton family, invests $7 million. Those investments are part of a $78.2 million fund. October 2008: Then Solyndra CEO Chris Gronet touted reasons for building in Silicon Valley and noted that the "company's second factory also will be built in Fremont, since a Department of Energy loan guarantee mandates a U.S. location." November 2008: Silicon prices remain very high on the spot market, making non-silicon based thin film technologies like Solyndra's very attractive to investors. Solyndra also benefits from having very low installation costs. The company raises $144 million from ten different venture investors, including the Walton-family run Madrone Capital Partners. This brings total private investment to more than $450 million to date. January 2009: Solyndra goes before a DOE credit review committee just one day before President Obama is inaugurated. The committee, consisting of career civil servants with financial expertise, remands the loan back to DOE because it wasn't ready for conditional commitment. March 2009: The same credit committee approves the strengthened loan application. The deal passes on to DOE's credit review board. Career staff (not political appointees) within the DOE issue a conditional commitment setting out terms for a guarantee. June 2009: As more polysilicon production facilities come online while demand for PV wavers due to the economic slowdown, silicon prices start to drop. Meanwhile, the Chinese begin rapidly scaling domestic manufacturing and set a path toward dramatic, unforeseen cost reductions in PV. Between June of 2009 and August of 2011, PV prices drop more than 50 percent. September 2009: Solyndra raises an additional $219 million. Shortly after, the DOE closes a $535 million loan guarantee after six months of due diligence. This is the first loan guarantee issued under the 1703 program. From application to closing, the process took three years. January - June 2010: As the price of conventional silicon-based PV continues to fall due to low silicon prices and a glut of solar modules, investors and analysts start questioning Solyndra's ability to compete in the marketplace. Despite pulling its IPO, Solyndra raises an additional $175 million from investors. November 2010: Solyndra closes an older manufacturing facility and concentrates operations at Fab 2, the plant funded by the $535 million loan guarantee. The Fab 2 plant is completed that same month -- on time and on budget -- employing around 3,000 construction workers during the build-out, just as the DOE projected. February 2011: Due to a liquidity crisis, investors provide $75 million to help restructure the loan guarantee. These restructuring investors are given priority over the government backed loan. June 2011: Average selling prices for solar modules drop to $1.50 a watt and continue on a pathway to $1 a watt. Solyndra says it has cut costs by 50 percent, but analysts worry how the company will compete with the dramatic changes in conventional PV. 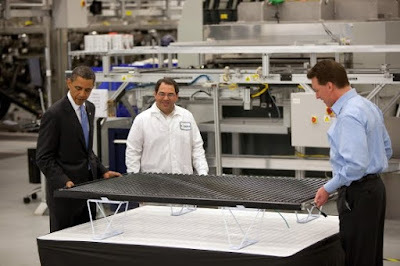 On August 31, 2011: Solyndra LLC, the American manufacturer of innovative cylindrical solar systems for commercial rooftops announced that global economic and solar industry market conditions have forced the Company to suspend its manufacturing operations. Solyndra intends to file a petition for relief under Chapter 11 of the U.S. Bankruptcy Code while it evaluates options, including a sale of the business and licensing of its advanced CIGS technology and manufacturing expertise. As a result of the suspension of operations approximately 1,100 full-time and temporary employees are being laid off effective immediately. The company said "despite strong growth in the first half of 2011 and traction in North America with a number of orders for very large commercial rooftops, Solyndra could not achieve full-scale operations rapidly enough to compete in the near term with the resources of larger foreign manufacturers. This competitive challenge was exacerbated by a global oversupply of solar panels and a severe compression of prices that in part resulted from uncertainty in governmental incentive programs in Europe and the decline in credit markets that finance solar systems." Overall DOE Loan Guarantee Portfolio Not in Trouble - of Sept. 12, the DOE loan programs office closed or issued conditional commitments of $37.8 billion to projects around the country. The $535 million loan is only 1.3 percent of DOE's loan portfolio. To date, Solyndra is the only loan that's known to be troubled. Lower Solar Prices - The same prices that helped drive Solyndra out of business are overall good for consumers and the solar industry. The solar industry also includes companies that focus on selling or installing systems, or developing large solar projects for utilities. Some of them thrive when panel prices are low. "When you have prices going down, it's really good for downstream solar companies," said Sheeraz Haji, chief executive officer of the Cleantech Group consulting firm. "It's really, really good for consumers." While panel manufacturers deal with their challenges, the installation of solar grew 67% in the US in 2010, with rapid growth in Q1 2011 as described in the recent solar industry report from the Solar Energy Industries Association. The price of solar power installation has not fallen as dramatically as the cost of panels for consumers or businesses - yet. The cost of solar installation is only partly based on materials so the cost of solar power for consumers so far as fallen only 12-17%. But with time the price of solar installation for businesses and homes will continue to fall as a result of the drop in the price of solar panels. Panels Absorb More Light - The cylindrical solar panels (think of fluorescent tube lights—except in reverse) can absorb energy from every direction (direct, indirect and reflected light). When combined with a white roof (the fastest growing segment of the commercial roof industry with over 1 billion square feet installed in 2008 and required for any new commercial construction in California), the company claimed that systems that employ the panels on a given rooftop could produce significantly more electricity in a given year. With a white roof, the panels can capture up to 20% more light than with a black roof. A direct bandgap material, CIGS has very strong light absorption and only 1–2 micrometers of CIGS is enough to absorb most of the sunlight. A much greater thickness of crystalline silicon is required for the same absorption. Consistant Output Throughout the Day - The panels did not have to move to track the Sun. The panels are always presenting some of their face directly perpendicular to the Sun. The daily production of flat solar panels has an output curve that has a clear peak while Solyndra claimed their system produced more power throughout the day. 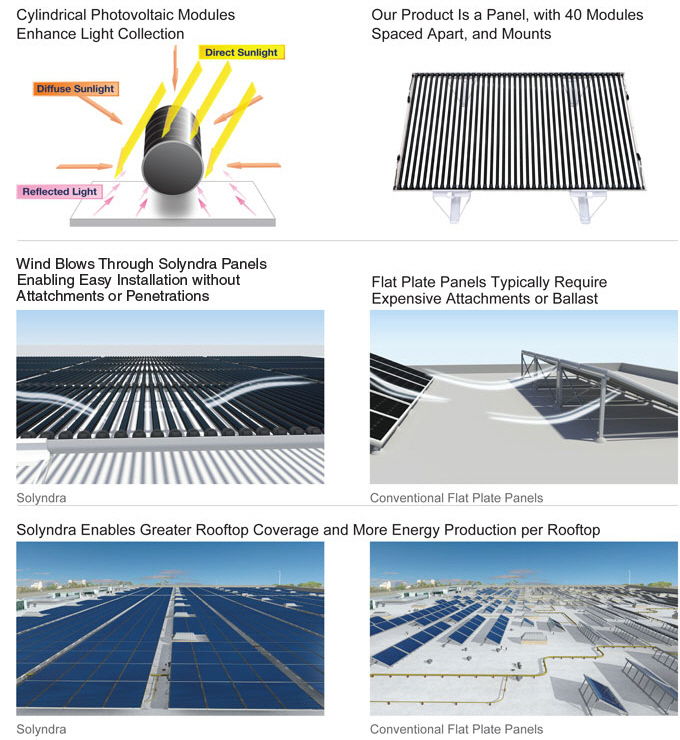 More Stable & Easier Roof Construction - The Solyndra panels allow wind to blow through them. Instead of being angled to face the sun like traditional panels, Solyndra's cylinders lie flat. According to the company, these factors enable the installation of PV on a broader range of rooftops without anchoring or ballast, which are inherently problematic. Solyndra claimed that wind and snow loads are negligible and that its panels are lighter in weight per area. User Comment: - I am a solar instructor; I have no ties to Solyndra or any other manufacturer, so I have no bias here. I proctor two installation labs for electricians training to do commercial solar installations. 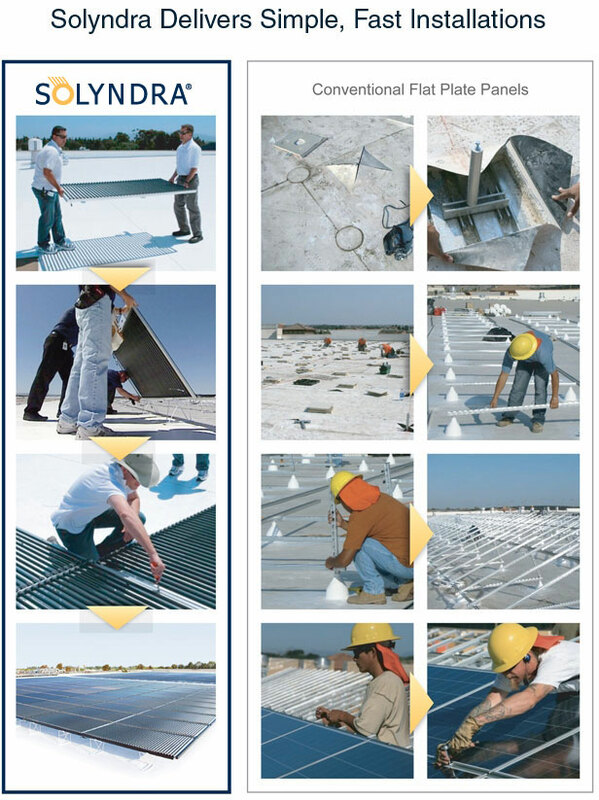 For flat, white roof commercial installations like you would see on big box stores, strip malls, and other flat-roof buildings, Solyndra offers a solution that requires no roof penetrations and a simple, easy installation. We have (2) labs that run at the same time slated for 16 hours of installation training. One involves installing several Solyndra modules on a flat, white TPO rubber roof. The other uses regular framed amorphous silicon PV modules on traditional aluminum racking and clamps for a metal standing-seam roof. The average time for the Solyndra installation: about 6-7 hours. Average time for frame/racking installation: 12-16 hours. Solyndra takes about half the time because there are fewer steps in the process. Also, many big box store rooftops were no built to hold much weight and other ballasted flat roof systems are much heavier that Solyndra because they have to withstand wind loads of up to 140 mph in most jurisdictions. Retrofitting to add necessary structural support is often too costly or not feasible. Solyndra was perfect for these types of situations and less expensive than having that added cost. Efficiency - Solyndra claimed the cells themselves convert 12 to 14 percent of sunlight into electricity, an efficiency better than competing CIGS thin-film technologies. However, these efficiencies are for the cells laid flat. The company did not post any numbers about performance when the cells are rolled up. The Solyndra 100/200 spec sheet doesn't mention the cells or the panel efficiencies directly. However, calculating from the data provided shows the high-end 210 panel has a field efficiency of about 8.5%. Potential Manufacturing Efficiencies - ;CIGS can be deposited in a polycrystalline form directly onto molybdenum coated glass sheets or steel bands. This uses less energy than growing large crystals, which is a necessary step in the manufacture of crystalline silicon solar cells. Also unlike crystalline silicon, these substrates can be flexible. Relative Toxicity - Compared to First Solar's CdTe, CIGS uses a smaller amount of toxic material cadmium are present in CIGS cells. Price Competitiveness - Solar cell prices have plunged, making the technology affordable to a growing number of homeowners and businesses. Sales are soaring as a result. "This is what we were hoping for," said Rhone Resch, president of the Solar Energy Industries Association, a trade group. "You have more competition, that leads to lower prices, and it's great for the consumer. But it's hard for some companies to compete." The price of solar panels, measured in dollars per watt of generating capacity, has fallen by as much as 30-42% just in the last year, driven in part by a surge in low cost Chinese solar panel imports. The Chinese manufacturers have benefited from not just low production costs and increasing scale, but also large subsidies from their own government. Solyndra was undercut by low-priced panels churned out by new factories in China, built with substantial backing by the Chinese government. Other U.S. solar-panel companies face the same pressure. Solyndra was the third domestic solar company to announce bankruptcy in August 2011, joining Evergreen Solar and SpectraWatt. "The U.S. solar panel industry is in horrible shape, and that's likely to continue as long as China continues to flood the market," said Severin Borenstein, director of the University of California Energy Institute in Berkeley. "At the current (price) levels, most U.S. companies can't survive." Solar Cells are now a commodity - The flood of inexpensive modules from China has turned the solar cell - once considered a high-tech product - into a commodity. Analysts say there will still be room for innovation - for newer, more efficient cells. But the companies making them will have a hard time charging a premium. Polysilicon Price Trends - The extremely high spot prices for polysilicon in 2007 and 2008 were a bubble. and not a good benchmark to build a long term business plan for a competing solar technology. In June 2011, quoted polysilicon spot prices were at $57.50/kg to $62.50/kg, cells were estimated at 0.90c/watt and panels at $1.33/watt. Industry insiders say they said they can see poly hitting $35/kg, maybe $30/kg, but at the same time they are not convinced the Chinese can produce volumes sufficient to drive cost much lower. That said, one contact noted that GCL appears to be standing fast by their $20/kg target. The polysilicon industry is dominated by 7 companies that supply around 90% of the total polysilicon market in 2009: Hemlock, Wacker Chemie, REC, MEMC, Tokuyama, LDK Solar and OCI Company. There are high capital requirements of $500m - $1bn for building a plant, and long lead times to add capacity. This is a very high fixed cost business. Thanks to the oligopoly and the notorious supply shortage, average gross margins have been exceptionally high at 83%, although they have come down to 49% by May 2009. Access to cheap energy is needed as the purification process requires a lot of energy. Polysilicon processing is estimated to be 85% of the energy input into the whole module. For instance, Wacker Chemie has own hydro power and co-generation unit for its plant. There are synergies of operating a fully integrated chemical plant with cost advantage over pure-play silicon producers. Most customers have long-term contracts with existing suppliers, making it difficult for new entrants. Due to the supply shortage 2006 - 2008, 90% of the market is governed by fixed supply agreements lasting 6 - 10 years. To secure those contracts, buyers were asked for pre-payments. Less well capitalised companies paid by selling equity. For instance, DC Chemicals bought 15% of Evergreen Solar stock in exchange for 1GW of polysilicon [oops]. MEMC received a warrant worth of a 4.9% share in SunTech. Subsidized Chinese Competition - China’solar cell industry now has a dominant sales position — almost three-fifths of the world’s production capacity — and rapidly declining costs. Some American, Japanese and European solar companies still have a technological edge over Chinese rivals, but seldom a cost advantage, according to industry analysts. Recent bankruptcies and closings represent almost one-fifth of the solar panel manufacturing capacity in the United States, according to GTM Research. China's low costs are not to inexpensive labor in China — high-technology solar panel manufacturing is not labor-intensive — but rather to free or subsidized land from local governments, extensive tax breaks and other state assistance. Loans at very low rates from state-owned banks in Beijing, cheap or free land from local and provincial governments across China, huge economies of scale and other cost advantages have transformed China from a minor player in the solar power industry just a few years ago into the main producer of an increasingly competitive source of electricity. The United Steelworkers union filed a legal complaint a year ago with the United States government, asking the Obama administration to investigate China’s clean energy subsidies and other policies and to bring cases against them at the World Trade Organization. The organization’s rules strictly prohibit export subsidies, to prevent countries from buying market share in foreign markets for their producers. The administration did challenge one Chinese government practice: giving subsidy grants of $6.7 million and $22.5 million to Chinese wind turbine manufacturers that agreed not to buy imported components. China agreed in June to discontinue the practice, but by then it had already built the world’s largest wind turbine manufacturing industry over the last five years and now has highly competitive Chinese producers for almost every component. For China, the calculus of subsidizing green industries is quite different, and that alone should warn U.S. policy makers away from trying to subsidize these technologies -- and consequently, jobs -- into existence. China’s one-party government has the political will and financial resources to effectively create millions of jobs, which helps to stabilize the society. Heavy subsidies, low labor costs and a desire to increase market share make it possible for Chinese producers to export products at very low prices. If we try to create industries simply through selective subsidies, the U.S. will lose the game of chicken with China. Instead, we need to do what we do well -- create innovative technology, business models and marketing platforms. Technical Transparency - Solyndra claimed the cells themselves convert 12 to 14 percent of sunlight into electricity, an efficiency better than competing CIGS thin-film technologies. However, these efficiencies are for the cells laid flat. The company did not post any numbers about performance when the cells are rolled up. The Solyndra 100/200 spec sheet doesn't mention the cells or the panel efficiencies directly. However, calculating from the data provided shows the high-end 210 panel has a field efficiency of about 8.5%. "The Solyndra data sheet doesn’t indicate the hours/day equivalent at peak watts. So I couldn’t calculate if the cylindrical architecture adds enough to compensate for increased cost per peak watt." I am also not sure about their “advantage” of capturing diffuse light. Albedo on a clean, brand new white roof may be has high as 75%, of which they catch how much? I would take those numbers with a big grain of salt. They come from Solyndra’s marketing department. If I could earn my money with writing tech papers I might be inclined to do a technology due diligence on their product…. My biggest concern would be the tens of thousands of vacuum tubes staying airtight over the next 25 years. They use a metal cap on a glass tube. Now I am not a material scientist, but the vastly different temperature expansion coefficient of the two materials is of concern. Yes they shield the silicon or whatever they use as a perma-flex sealant from sun light, but in a real world production with real world mistakes and problems, there will be leaking tubes. How quick will one detect them (if at all)? how much will those pull down the rest? what will be a realistic “advantage” after 5 years, 7 years??? and hence the real LCOE? If I was to offer such a system to a client, I would want to see a substantial price discount in exchange for the technology risk I and my client assume. That means they need to be 25% cheaper, not 50% more expensive than the well proven, low risk flat plate technology. The fundamental problem is this: They use 3x the material for these time of day and time of year improvements that are dubious at best. It doesn’t add up and never has. Financial Transparency - The problems start to occur when the IPO is suspended, the reality of cost targets become clear, and a new CEO is put in place. Brian Harrison, the new CEO, is installed at the helm of this Titanic at a salary of more than $400,000, and not to defend him, but he's inserted into an untenable position. No management skills or manufacturing process skills could alter the course of this company. The more solar modules the company shipped, the more the company lost and the faster the money was running out. ;The CEO and the CFO had to know this. Somewhere in a file, wastebasket, or hard disk drive is the evidence that the FBI is seeking -- that the officers of the company knew, as their auditors declared in March 2010, that they were not a "going concern," and that the hammer was going to come down hard and soon. Criminal Conduct - What did Solyndra's executive team know and when did they know it? On Friday, September 23, Soyndra's top executives declined to testify before a congressional hearing investigating their half-billion dollar government loan. Solyndra Inc. CEO Brian Harrison and the company's chief financial officer, Bill Stover, both invoked their Fifth Amendment right to decline to testify to avoid self-incrimination. Harrison told the House Energy and Commerce Committee Friday: "On advice of counsel, I respectfully decline to answer any questions. Republican House Energy and Commerce Committee leaders said the administration may have violated the law when it restructured Solyndra's loan in February in such a way that private investors moved ahead of taxpayers for repayment in case of default. The economic stimulus law provides for taxpayers to be ahead of other creditors in the event of bankruptcy or default. Deputy Energy Secretary Daniel Poneman said Thursday, September 22 that the restructuring was "entirely legal," noting that another aspect of the law requires Chu and other officials to protect the overall interests of taxpayers. He said the restructuring accomplished that because it gave the struggling company a better chance to succeed. Loan Guarantee Process - This technology was a bad bet before China Inc. came onto the solar scene and before solar panel prices plunged to their current levels. The DOE is guilty of misjudgment on the technology and also made market misjudgments. There was poor due diligence by the VC's and the DOE. The core technology of this company was novel, innovative, and not worth commercializing. It has been reported that three years ago the original Solyndra inventors and patent holders thought the packaging requirements for this design rendered it incapable of being competitive. Entrepreneurs fall in love with their technology and become blinded to market reality every day. Venture capitalists are supposed to know better than to let this happen to them, but that's what happened here. This technology was a bad bet before China Inc. came onto the solar scene and before solar panel prices plunged to their current levels. There was a strong desire to get a factory built, money deployed, and jobs created. In the coming weeks and months we'll see what corners were cut to get to that objective at the DOE. Nuclear Energy Loan Guarantees - Taxpayers have lost far more money to previous government bets on risky energy projects. Chief among them is nuclear power, which depends on hundreds of millions in government subsidies. Moreover, the risk of default on nuclear loans has been estimated at around 50 percent. CSP - Concentrated Solar Power - Loan Guarantees Why is the DOE is continuing to approve LGs to CSP projects? Since 2008, the price of PV solar modules has fallen by more than half, whereas the cost of building a CSP plant is about the same today as it was three years ago. With CSP you assume economies of scale so a 500 MW plant should produce cheaper electricity than a 250 MW plant. Following this basic line of reasoning, how can you approve a loan on a 250 MW plant after a 500 MW plant as been cancelled due to competitive pressure? Looking at things differently, why approve a loan for a plant that’s going to cost $5/Watt when a much smaller PV farm could be built at nearly half the cost? Who’s approving these loans and what are they thinking? There are 6 billion in CSP loans are out there right now. . Complex mega-projects tend to go overbudget. On the other hand, while individual project economics may not be as efficient for CSP than PV, CSP power generation projects should be low risk bets because, upon completion, they will generate revenue based on the PPAs tied to the projects. Giving the DOE some authority to cosign a loan to build a power plant with a customer under contract to purchase every MW produced for 20+ years may not be overly risky. The role of government in a CSP project build is to facilitate competition (to nuclear, natural gas, coal, and PV) by enabling competitive technology deployment. Lender of Last Resort ;- The government runs a great risk of becoming “the lender of last resort” and supporting projects too risky for banks or venture capitalists. Economics of Green Jobs - Once the large scale manufacture is well in hand corporations now built factories wherever the cost of sufficiently skilled labor is lowest. A well thought out production process does not need particularly high technical skills. Everybody cannot be an innovator or an entrepreneur. For the country to maintain a high standard of living it must provide high paying jobs. The idea that simply nurturing more R&D and educating large numbers of engineers is sufficient is just plain wrong. There is need to think exactly what kind of jobs can be made available to the average Joe and how to make sure he does not lose it after a few years to somebody in Asia. Solar installation jobs for unemployed construction workers is a more practical solution than building a single automated factory for half a billion dollars. Even though it can't be exported to Asia, solar installation is never going to replace the entire housing industry. Presidential Politics - Solyndra was the first renewable-energy company to receive a loan guarantee under a stimulus-law program to encourage green energy and was frequently touted by the Obama administration as a model. President Barack Obama visited the company's Silicon Valley headquarters last year, and Vice President Joe Biden spoke by satellite at its groundbreaking ceremony. The administration hurried Office of Management and Budget officials to finish their review of the loan in time for the September 2009 groundbreaking has become an embarrassment for Obama as he tries to sell his new job-creation program. August 2009 e-mails, released exclusively to The Washington Post, show White House officials repeatedly asking OMB reviewers when they would be able to decide on the federal loan and noting a looming press event at which they planned to announce the deal. In response, OMB officials expressed concern that they were being rushed to approve the company’s project without adequate time to assess the risk to taxpayers, according to information provided by Republican congressional investigators. White House officials said Tuesday that no one in the administration tried to influence the OMB decision on the loan. They stressed that the e-mails show only that the administration had a “quite active interest” in the timing of OMB’s decision. “There was interest in when a decision would be made because of its impact on whether an event involving the vice president could be scheduled for a particular date or not, but the loan guarantee decision was merit-based and made by career staffers at DOE,” White House spokesman Eric Schultz said. The House Energy and Commerce Committee chairman, Rep. Fred Upton, R-Mich., compared the Solyndra loan to the Great Train Robbery in England in the 1960s. "It appears we have a great heist of over half a billion dollars and ... maybe even co-conspirators called the U.S. government," Upton said. Upton faulted the Obama administration for its role in the loan, saying at a minimum the Energy Department did not complete due diligence on the company, which lost hundreds of millions of dollars in the years before the loan was approved. He called the loan "reckless use of taxpayer dollars on a company that was known to pose serious risks before a single dime went out the door." Rep. Cory Gardner, R-Colo., said it was important for the committee's investigaton to continue. "The American people deserve answers. Half a billion dollars is missing," he said. GOP lawmakers said they were expanding their inquiry into the Solyndra loan, which has become a rallying point for Republican critics of the administration's push for so-called green jobs. The world will need 50 percent more energy by 2035. To compete in the world economy and generate manufacturing jobs in the coming decades, the United States needs to both nurture a green economy and reduce our reliance on fossil fuels. How can the government fulfill this role? Picking winners certainly runs contrary to our moral fabric as capitalists, but need only end in travesty if our position on the spectrum is ignored. There is a middle ground in which government can steer investment into areas that are understood to be in society’s best interest while avoiding absolute abrogation of our free market principles. Support Basic Research - Taxpayers should shy away from directly investing in energy production. Government's real strengths are supporting basic research and fostering an active private venture capital community. Recently, the government has been abandoning its support of basic research in favor of playing venture capitalist with loans. Foster Alernatives - The role of government in a renewable project build is to facilitate competition (to nuclear, natural gas, coal, and PV) by enabling competitive technology deployment. If competitive market forces fundamental to capitalism, and capitalism is good for America, supporting renewable energy project development is a good thing. Without this low risk support, long term development of cost competitive alternatives is stymied. Help Overcome Scaling Issues - Often government subsidies seed new industries at a loss, not necessarily for the R&D process and tech generation issues, but the scaling issues that exists in an asymetrically oriented market place, where the incumbants have undue power to subdue and eliminate alternatives to what they offer. Doing something new is inherently more risky than proven methods. Discover what did Solyndra's executive team know and when did they know it? On Friday, September 23, GOP lawmakers said they want the administration to turn over all communications between the Energy Department and White House related to Solyndra, as well as all communications between Energy and the Treasury, which lent Solyndra the money. In September 2011, the U.S. Treasury Department launched an investigation, as well as the FBI. and the DOE OIG. In an era when some people view energy-efficient light bulbs much in the same way that their political precursors viewed fluoride in drinking water, we can expect that this episode will result in even more political pressure for even the more effective governmental programs to be undermined and assaulted. If nothing else, politicization of the clean energy sector just adds further regulatory uncertainty to the environment we all operate in. And it could filter down to the state level, where to date, cleantech cluster creation has been a non-partisan issue. Perhaps Solyndra's technology will simply go the way of the dinosaurs, and standard flat panels (crystalline silicon or thin film) will have won out. But when the dust and lawsuits settle, Solyndra’s technology could still be made available to the world – just under another name and likely via a factory in China. Madrone Capital Partners, Menlo Park, CA - Not much is known on the internet about Madrone Capital Partners, other than this article describes them as “a Menlo Park-based private equity firm associated with Rob Walton, the eldest son of Wal-mart founder Sam Walton.” Jameson McJunkin, general partner of Madrone Capital Partners, a family fund will be called to testify at a House Energy Sub-committee hearing as soon as Friday September 23. Argonaut Private Equity, 6733 South Yale, Tulsa, OK - No website, but same street as GKFF. Steve Mitchell managing director of Argonaut Private Equity, a family fund will be called to testify at a House Energy Sub-committee hearing as soon as Friday September 23. Artis Capital Management, San Francisco - A hedge fund crossing over into venture capital, It is so secretive that a password is required to access its website, including the “about us” link on its homepage. Many of its investments in private companies don’t show up on the startups’ regulatory filings. David Lamond, son of Sequoia Capital Partner Pierre Lamond, is an investor at Artis, though his exact title is now known. Nor is it known how long he’s been at the hedge fund or what deals he’s been involved in. An Artis spokesperson would not discuss how much the firm made on the 2006 YouTube sale to Google, though Artis Fund Manager Stuart Peterson agreed to pay $20 million to buy the former home of retired tennis stars Andre Agassi and Steffi Graf. The estate in Tiburon, Calif., covers 3.5 acres, includes two swimming pools and boasts views of the Golden Gate Bridge and the San Francisco skyline. FFB - Federal Financing Bank ;- A United States government corporation, created by Congress in 1973 under the general supervision of the Secretary of the Treasury. The FFB was established to centralize and reduce the cost of federal borrowing, as well as federally-assisted borrowing from the public. The FFB was also established to deal with federal budget management issues which occurred when off-budget financing flooded the government securities market with offers of a variety of government-backed securities that were competing with Treasury securities. Today the FFB has statutory authority to purchase any obligation issued, sold, or guaranteed by a federal agency to ensure that fully guaranteed obligations are financed efficiently. As of September 2010 it has assets of $61.6bn with a net position of $3.8bn. On March 20, 2009, the DOE offered a $535 million loan guarantee to Solyndra, Inc. to support the construction of a commercial-scale manufacturing plant for its proprietary solar photovoltaic panels. After securing the loan guarantee, the FFB , loaned Solyndra the money. How were other CIGS firms funded and how are they faring? Ascent Solar - (NASDAQ: ASTI) - Littleton, CO - was founded in 2005 by ITN Energy Systems, a company engaged in commercializing emerging energy technologies through spin-offs and joint ventures. During the first few years of operation, its primary focus was to research the CIGS thin-film technology as well as researching efficient methods for manufacturing. Said that its CIGS cells from its factory had reached an average efficiency of 19 percent. In July , 2006, Ascent completed its IPO, releasing 3,000,000 shares at $5.50 per share. ;In June 2007, Norsk Hydro ASA, a Norwegian based supplier of aluminum products, entered into a deal with Ascent whereby it purchased 23% of Ascent shares with the option to increase that stake to up to 35%, which it did in October 2008. On September 23, 2011, ASTI traded at $0.78 per share down from a peak of $5.66 in October 2010. The Company recorded an impairment loss of $78.0 million to write down its long-lived assets to fair value at June 30, 2011 reducing its net assets by about half. Revenue for the quarter ending Jun 30 was $1,026,984. DayStar Technologies, Inc.- (Nasdaq: DSTI) - Milpitas , CA - . Its primary product is CIGS on glass or plastic substrate. which has shown a 19.5% NREL efficiency in real world conditions, slightly above CdTe and significantly above amorphous silicon. Though founded in 1997, DayStar is still in development mode. On September 23, 2011, DSTI was trading at $0.24, down from a peak of $59.04 at the end of 2007. Global Solar Energy - Tucson, AZ - a manufacturer of (CIGS) thin-film solar cells founded in 1996, with manufacturing operations in Tucson, and Berlin, Germany. It has said that its CIGS cells from its factory had reached an average efficiency of 10 percent. In Tucson, Global Solar partnered with Solon to create a 750 kilowatt (kW) solar array, the largest CIGS solar field in the US. It offers CIGS thin-film solar on a flexible substrates, portable solar chargers, and solar glass modules for applications in residential, utility-scale, military, space, commercial, and government products. Global Solar uses an inline three stage deposition process. In all of the steps Se is supplied in excess in the vapor phase. In and Ga are first evaporated followed by Cu and then by In and Ga to make the film Cu deficient. These films performed quite favorably in relation not only to other manufacturers but also to absorbers grown at NREL and the Institute for Energy Conversion (IEC). However, fully fabricated modules of Global Solar’s films did not perform as well. The property in which the module most obviously under-performed was a low VOC, which is characteristic of high defect density and high recombination velocities. Interestingly, Global Solar’s absorber layer outperformed the NREL absorber in carrier lifetime and hall mobility. However, as completed cells the NREL sample performed better. This is evidence of a poor CIGS/CdS interface, possibly due to the lack of an ODC surface layer on the Global Solar film. HelioVolt Corporation - Austin, TX - A privately held U.S. energy company in the solar energy sector. It manufactures photovoltaic solar modules using a thin film semiconductor process based on Copper Indium Gallium Selenide (CIGS) to produce photovoltaic modules. It manufactures thin film solar PV modules for commercial rooftop, utility-scale ground mount, residential, BIPV and custom installations. The company has attracted over $130 million in investment. It is based in Austin, Texas. Heliovolt patented a Precursor combination by wafer-bonding inspired technique and has named it the FASST process. In this process, two different precursor films are deposited separately on a substrate and a superstrate. The films are pressed together and heated to release the film from the superstrate leaving a CIGS absorber on the substrate. This technique allows the superstrate to be reused Therefore, Heliovolt is the only company currently scaling up the technique. In principle, the precursors can be deposited at low temperature using low cost deposition techniques, lowering the final cost of the module. However, the first one or two generations of product will still use higher temperature PVD methods and not achieve full cost cutting potential. Flexible substrates could eventually be used in this process. Typical film characteristics are not known outside of the company as no research has been conducted by independently funded laboratories. However, Heliovolt has claimed a top cell efficiency of 12.2%. In September 2011, SK Innovation Co.,(part of South Korea's fourth largest conglomerate (Chaebol)), agreed to invest $50 million in closely held thin-film panels production company HelioVolt Corp. to obtain a key technology for its solar batteries business. The investment will help the company to test the feasibility of commercial production of HelioVolt's CIGS, photovoltaic technology to lower the cost of producing solar batteries, SK Group plans to invest 17.5 trillion won ($15.6 billion) by 2020 in alternative energy and new technology as it seeks fresh sources of income. SK Group’s units are involved in the production of polysilicon wafers and materials for solar batteries. The company is focused on large-scale commercial and utility projects, and is looking to incorporate its flexible stainless steel substrate. MiaSolé has customers in five countries, Germany, Italy, Spain, France, Portugal and the United States. Industry research expects the market for solar panels that use thin-film technology instead of traditional silicon-based materials to more than double by 2013. Thin-film now represents 20% of the solar market. Nanosolar - San Jose, CA - Also developing CIGS solar power technology. Nanosolar has developed and commercialized a low-cost printable solar cell manufacturing process. The company started selling panels mid-December 2007, and plans to sell them at around $1 per watt. When first announced that was just one fifth the price of the silicon cells, but in 2010 brand name silicon cells sell from around $1.70 reducing Nanosolar's cost advantage significantly. Nanosolar is extremely secretive about their ink. The ink composition is unknown but there is some implication that Se is also incorporated into Nanosolar's ink. Nanosolar has reported a cell (not module) efficiency of 14%, however this has not been verified by any national laboratory testing, nor are they allowing any onsite inspections of their facilities to verify this and other claims made in the past. Nanosolar received the largest amount in a round of Venture Capital technology funding amongst United States companies during Q2 2006, with $100 million of new funding secured. It also received the largest amount of financing of any private company in 2008 (USD 300 million in Q1). Q-Cells SE (German Website) (wiki) Bitterfeld-Wolfen, Germany - In March 2011, this photovoltaic firm, has achieved a world efficiency record for mass-produced CIGS thin-film solar modules manufactured via monolithic integration. The efficiency rate of 14.7 percent for Q-Cells Q.SMART UF solar module was confirmed by the Fraunhofer Institute for Solar Energy Systems. It's unfortunate that this investment didn't quite work out the way they wanted it to. We could really use good developments in alternative sources of energy, given the oil crisis and all.